WASHINGTON – The House Democratic Caucus and the House Republican Conference, in cooperation with the Cincinnati Children’s Hospital Medical Center, the Democratic Leadership Council, and the Congressional Institute are pleased to announce the second debate in the “Congress Debates” series will be held in Cincinnati, Ohio on April 28. This debate will focus on a subject of great concern to all Americans – health care. “Congress Debates” is a series of bipartisan debates, launched in February in an effort to foster bipartisan dialogue on the most important issues facing America and to generate substantive discussion that goes beyond sound bites and partisan talking points. 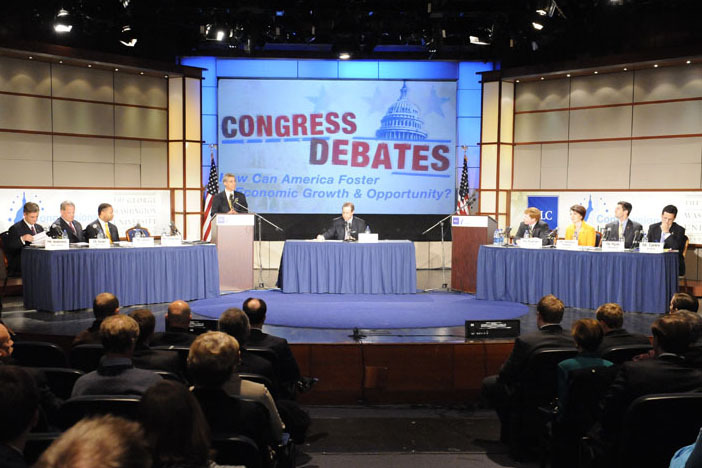 “Congress Debates” is an effort to break through the rancor of Washington and return real policy discussion to the debate between the parties. The second debate in the “Congress Debates” series will be held at 2 p.m.on Monday, April 28 at Cincinnati Children’s. Eight Members of Congress – four Republicans and four Democrats – will debate the state of health care in America and ways it can be made more affordable and accessible. Participants in the second debate will be: Rep. Xavier Becerra (D-CA), Rep. Marion Berry (D-AR), Rep. Charles Boustany, M.D. (R-LA), Rep. Shelley Moore Capito (R-WV), Rep. Kathy Castor (D-FL), Rep. Nathan Deal (R-GA), Rep. Allyson Schwartz (D-PA), and Rep. John Shadegg (R-AZ). The debate will be moderated by National Public Radio health policy correspondent and CongressDaily contributing editor Julie Rovner. For additional information about “Congress Debates,” please contact the House Democratic Caucus, House Republican Conference, the DLC or the Congressional Institute.